THIS PROJECT HAS FASCINATED US SINCE WE FIRST WON THE COMPETITION. IT IS LIKELY TO START ON SITE IN 2015. THE PROJECT WAS INITIATED BY SANPARKS AND IS DESIGNED TO HAVE A MINIMAL IMPACT ON THE BEAUTIFUL LANDSCAPE OF GOLDEN GATE. IT WILL BE BUILT ON THE ONLY DISTURBED GROUND IN THE VALLEY NEXT TO THE CAMPSITES AND WILL BE A VISITOR CENTRE THAT TELLS THE STORY OF THE DINOSAUR EGGS DISCOVERED RECENTLY WHEN THE ROAD WAS CUT THROUGH THE VALLEY. THESE ARE THE OLDEST KNOWN DINOSAUR NESTS IN THE WORLD, FOUND AT THE SAME PARK WHERE SCIENTISTS PREVIOUSLY UNEARTHED THE OLDEST KNOWN DINOSAUR EMBRYO. THE AREA IS FILLED WITH FOSSILS OF LARGE DINOSAURS IN THE SANDSTONE ROCK AND IS LIKELY TO BECOME A BUSY HOLIDAY STOP IN THE GOLDEN GATE PARK. 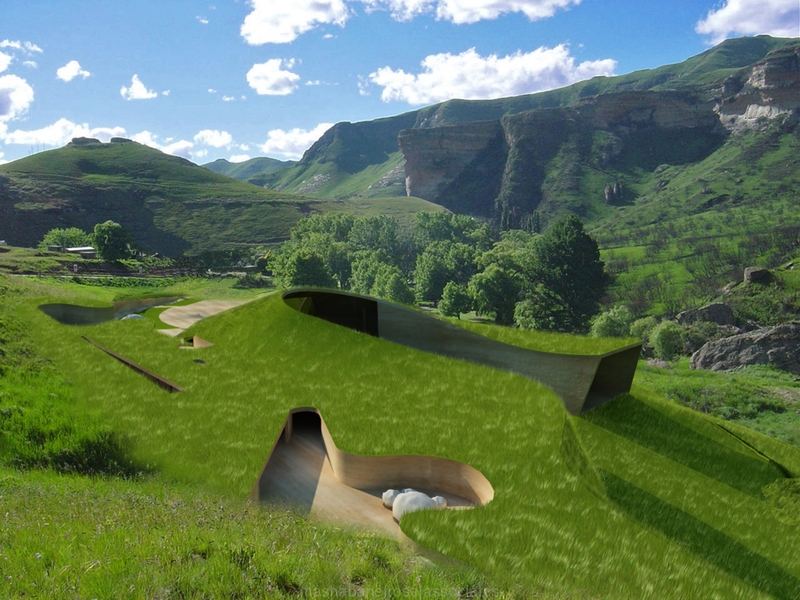 THE DESIGN DRAWS ON THE IDEA THAT THE DRAKENSBERG WAS A DUNE-SCAPE WHICH WENT THROUGH THREE EXTINCTION EVENTS THAT SLOWLY SOLIDIFIED THE MOUNTAINS INTO SANDSTONE CLIFFS WHICH ARE SO BEAUTIFULLY FORMED TODAY. CENTRAL TO THE DESIGN IS THE WAY IN WHICH THE BUILDING IS CAMOUFLAGED BY BEING GRASSED OVER SO THAT HIKERS IN THE AREA DON’T HAVE TO LOOK DOWN ON ROOFING OR AIR-CONDITIONING EQUIPMENT. THE GENTLE OUTLINE OF THE LANDSCAPED ROOF WHICH CURVES AROUND A CENTRAL SPACE LOOKING UP AT THE CLIFF FACE WILL BE A DRAMATIC MOMENT. THE CARS AND BUSES ARE PLANNED TO PARK UNDER THE TREES THAT EXIST TO REDUCE THE VISUAL IMPACT OF THESE AREAS FOR THE HIKERS TOO. THE BUILDING IS A WALK- THROUGH EXHIBITION SPACE, WITH THE EXIT ADJACENT TO THE VISITOR TEA GARDEN AND GIFT SHOP. AREAS FOR RESEARCH, FOSSIL CLEANING AND STUDY ARE PLANNED AS AN EXTENSION OF THE CURRENT WORK BEING DONE BY WITS UNIVERSITY. THE SHAPING OF THE EXISTING LANDSCAPE TO FORM A BUILDING, WHICH IS MORE A MINIMALIST SURFACE RELIEF USING THE EXISTING LANDSCAPE, IS THE STRENGTH OF THIS CONCEPT.